Multiple allusions and meanings are suggested by the title of this new LCMS release. In one sense, the idea of a path, or of progress in a given direction is at odds with the relative stasis of much the music. It is apt in other ways though, in particular in the choice of composers for the project. Two top selling, senior names from the first generation of religious minimalism are represented: Arvo Pärt and John Tavener. But the rest of the music is by younger composers, suggesting perhaps a path towards the future of this kind of music. 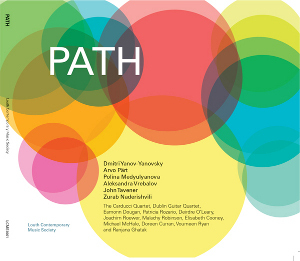 The term 'path' could also refer to the Silk Road, for much of this music either originates from, or alludes directly to, cultures of central Asia. Yanov-Yanovsky's 'Chang Music IV' was commissioned by the Kronos Quartet, and its place at the start of this programme sets the tone of the disc, a tone very similar to that of many Kronos releases. It evokes the chang, a string instrument of Uzbekistan that is apparently plays continuous glissandos. Yanov-Yanovsky is himself Uzbek, although that doesn't necessarily make him immune from charges of orientalism when writing to an American commission. But whatever the ethnography here, and elsewhere on the disc, the result is very enjoyable. It is tranquil, but there is always a slight edge to the timbre. That edge is a recurring feature in the following works. Most are calm, but not so eventless as to be ambient. The programme strikes an impressive balance between spiritual directness and intellectual engagement. The variety of approaches from the various composers means that that balance is reconfigured and re-evaluated with almost every work. The programme works forwards and backwards of Yanovsky, at least in terms of the ages of the composers. The contributions from Pärt and Tavener, while they may help the disc to sell, are not the most interesting works on offer. Pärt's arrangement of (the already oft-arranged) 'Summa' for guitar quartet is a canny reworking, the addition of the plucked strings to the sustained chords giving just enough added interest to justify it. His 'Von Angesicht zu Angesicht' seems to recall the composer's avant-garde days, interspersing as it does sustained vocal textures with almost pointillist interjections from the clarinet and viola. John Tavener has many followers, who seem curiously accepting of his various eccentricities, but 'Epistle of Love' may stretch even their patience. It is a song cycle for soprano and piano, although you could easily mistake the accompaniment for a harp. It is written in a sort of pseudo-medaevil style, which I have to say, does nothing for me. His 'Sámaveda' is slightly more interesting, including as it does a tampura, which is an Indian drone instrument. Of course, the interaction a composer can have with an instrument that only plays a single note is always going to be limited, but it is an interesting touch. Much, much more interesting, however, are the three works by the unknown composers, or at least unknown to me. Polina Medyulyanova is another Uzbek composer, but she is more comfortable than Yanovsky with Western idioms. Her work 'Ewige Ruhe' is for soprano, clarinet and string quartet, and stylistically seems to transcend any sense of location. Religious minimalism from Eastern Europe has clearly had an influence, but there are also French and German flavours here, and all woven up in the simplest of textures. Vrebalov's 'The Spell III' for violin and live electronics is that rarest of works, an electro-acoustic piece that makes subtle use of the electronic component. The sound of the violin is manipulated to create almost vocal background sounds, chants and cries. Nadarejshvili's String Quartet no.1, of which only third movement is presented, builds clouds of string textures around themes taken from Georgian chant. It is an effective device, and all the more so for the fact that there is always some definition to the sound. Like all the works on the disc, its ambience is tempered by the always apparent presence of the individual instruments, and by articulations that pinpoint the individual notes in the texture. The term 'religious minimalism' is clearly becoming obsolete as the composers from the East who specialise in spiritual music increasingly broaden their horizons. The younger composers showcased here are not of a generation who were defined, artistically speaking, through explicit opposition to Soviet aesthetic ideology, and the result seems to be music that engages with a wider cultural context, yet has the same intensity of feeling and emotional focus. The performances and recordings here are excellent, and well up to the standards set by the previous LCMS release 'A Place Between'. Unlike that earlier recording, this one was made in four different locations, not all of them churches, yet a consistently ambient acoustic is maintained throughout. Of the performers, soprano Particia Rozario deserves special mention, as does the Carducci Quartet, who prove impressively adept at moving between the styles of the various composers. The packaging design is adventurous, more so than the big labels dare these days, or perhaps more so than the big labels are prepared to pay for. Happily, LCMS is the kind of organisation that is prepared stand out from the crowd. In terms of programming, that's the real strength of this disc. I'm sure many people will buy it to hear the Tavener and Pärt, but I suspect they will find themselves enjoying the works of the younger composers more.